Definition at line 22 of file AMDGPUPerfHintAnalysis.h. Definition at line 47 of file AMDGPUPerfHintAnalysis.h. Definition at line 26 of file AMDGPUPerfHintAnalysis.h. Definition at line 30 of file AMDGPUPerfHintAnalysis.h. References isMemoryBound(), needsWaveLimiter(), and llvm::AnalysisUsage::setPreservesAll(). Definition at line 380 of file AMDGPUPerfHintAnalysis.cpp. 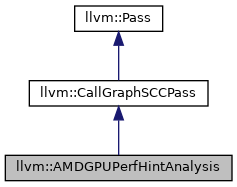 Definition at line 388 of file AMDGPUPerfHintAnalysis.cpp. Definition at line 367 of file AMDGPUPerfHintAnalysis.cpp. References llvm::TargetMachine::getSubtargetImpl(), llvm::ARM_MB::ST, and llvm::SystemZISD::TM. 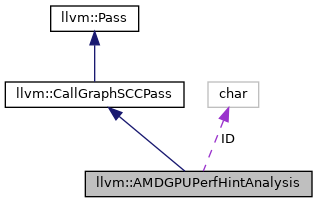 Definition at line 23 of file AMDGPUPerfHintAnalysis.h.